The Opera House curtains open on an elaborately decorated Roman church, its walls deep scarlet, the religious paintings over the altar and on the left side of the apse painted in the fleshy and darkly sensual style of the late Renaissance. There, in front of an easel, the painter Cavaradossi contemplates his portrait of Mary Magdalene and sings about feminine beauty and love. In San Francisco Opera’s Sunday performance of Puccini’s Tosca, “Recondita armonia” revealed all the strengths of tenor Brian Jagde’s voice: big, warm and rich, most comfortable in bravura sequences, a voice drenched in masculinity. His sureness, as he tells of his love for Floria Tosca, is overshadowed by the allure of another woman, whose mysterious attraction reveals a suggestion of his own oblivious and unintentional capacity for infidelity. It’s a perfect cauldron for Tosca’s jealousy to simmer in. Carmen Giannattasio as Floria Tosca. Photo by Cory Weaver/ San Francisco Opera. Soprano Carmen Giannattasio’s interpretation of Tosca in her debut of the role slips into this narrative with breathtaking ease. Like so many women who command power in a heavily patriarchal world Giannattasio’s Tosca drapes that power in a childish flirtatiousness. She is childish but focused, coquettish but unrelenting, playful but demanding. Add to that Giannattasio’s solidly dramatic voice with depth of color and ease of assurance and you have an intriguing character, very different from what her contemporary manifestation might be but utterly believable across time and cultures. Jagde and Giannattasio’s encounter in the church was like the painting on Cavaradossi’s easel: a melding of contrasting beauties that enhanced each in turn. Baritone Scott Hendricks sang Scarpia, the perverse and evil chief of police, who will destroy the two lovers and himself. Hendricks projected enough calculating wickedness for the part, but was not vocally equal to the two leads, who both have massively strong voices. Sitting on the right side of the audience, his otherwise chilling “Va Tosca” was nearly lost as he sang from the opposite side of the stage, the chorus singing “Te deum laudamus” and the orchestra rising at the end of the first act. Scott Hendricks (left) as Scarpia in the final scene of Act 1 of Puccini’s “Tosca”. Photo by Cory Weaver. Dale Travis sang the buffish sacristan, Joel Sorensen the wickedly weak Spoletta, baritone Hadleigh Adams sang the escaped rebel Angelotti and Christian Pursell the Jailer. All acquitted themselves well in an opera focused on the love and hatred between the three leads. British conductor Leo Hussain directed carefully from the podium. The sound lacked the lushness usually found in Puccini but even so the orchestra sounded beautiful, and there was no chance that the music could slide into mawkishness. Shawna Lucey’s direction was comfortable and well thought out. 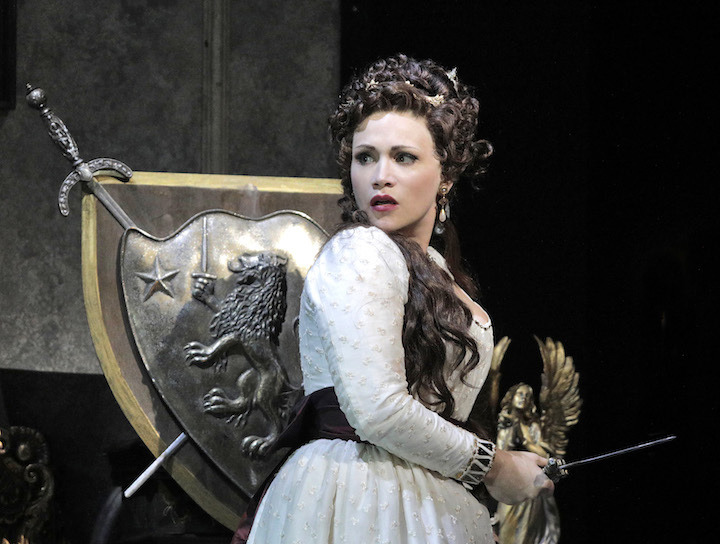 Except for one thing: the staging of “Vissi d’arte.” After a crushing “interview” with Scarpia, Tosca understands that she must either let her lover die, or accept Scarpia’s lewd desire. In that moment of despair she questions the meaning of her life and even her god, saying that she has always never given harm to anyone. While I understood Tosca is at the absolute lowest point of her life, I hated that she sang the opening of this despairing meditation on the floor, on her stomach. It robbed the singer of the power this aria deserves and the small scrap of dignity inherent in Tosca that allows her to find the courage to stab Scarpia, urging him at the same moment to die. I got the concept, but hated the staging anyway. The new sets and costumes by Robert Innes Hopkins were gorgeous, and newly crafted by San Francisco Opera’s scenic and costume shops. 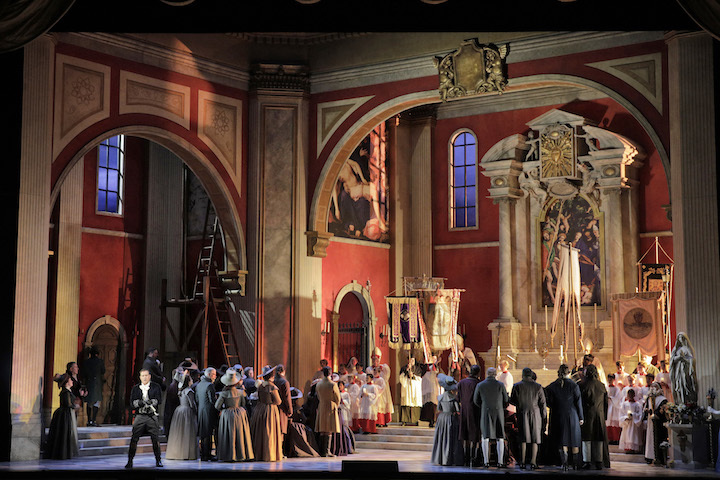 Puccini’s Tosca continues at San Francisco Opera through October 30. For tickets and information, visit sfopera.com.